Mohinder Amarnath the "Comeback King" of Indian cricket is a national selector now!! Remember, the same Mohinder, two decades back, called the selectors "bunch of jokers"? Now Ajit Agarkar, Vinod Kambli fancy their chances of making a comebak into the Indian team. Its an occassion for the Indian cricket fans to celebrate as Mohinder won't torment them as a commentator and as an analyst in those post match studio discussions. But we will miss his pronunciations. For him Rahul Dravid was Rahul "Dray vid". Its like a David with a "R". Mohinder"s gems like "India has 5 bowler" will be sorely missed! The Indian commentary box has had a quite a few characters. Who can forget Dr. Narottam Puri, the Harsha Bhogle of yesteryears with his inimitable style, "i don't think he'll stop it, he doesn't" when the ball raced past the boundary and the mild and cheerful Fredun de Vitre was a treat to the ears! 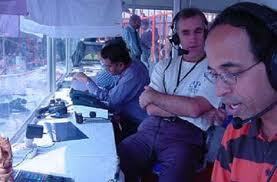 Ravi Chaturvedi and Sushil Doshi were the Kasparov and Karapov of the hindi commentary. The nasal tone of Ravi Chaturvedi when he said "kitne acche fielder hai Azharrrrrr.." would today, make Himesh Reshammiya' turn green with envy. Thank god music lovers had some taste, those days, else Ravi Chaturvedi would have cut his own music album. Sushil Doshi was the only hindi commentator who often forgot he was on Television and not on Radio. His radio commentary on television was amazing. His "cover or long off ke beech se nikaala...seedhe boundary ke baahar, chaar runnnnn" in one breath, was the original inspiration for Shankar Mahadevan's "Breathless". Those days, there were only two lines which had an impact on Indians. One was "main tumhare bacche ki maa banewali hoo"with screen villains Ranjit and Shakti Kapoor at the receiving end of that line and the other was "bhaagyashaali rahe balle ka baahri kinara nahi liya" by Sushil Doshi to a ball which was 2 kilometeres from the outer edge of the bat!! The live telecast of 1984 Benson and Hedges cup in Australia, had greats like Ian chappell, Richie Benaud, Bill Lawry as the commentators and with Stump microphones, replays in different angles, made the normal Doordarshan viewer drool like a Walt Disney character! When Richie Benaud said "hep shu lit lee shoe pub" it took an Indian viewer quite some time to understand that he actually meant "Absolutely superb"! Harsha Bhogle, the best thing to happen to Indian cricket apart from the Prudential World cup 1983, took the cricket commentary in India to another level. Who else could come up with gems like this; " the only time Sachin does not get a standing ovation is when he gets out of bed". Said he about Malinga's yorkers "If you want to design a missile , design it on malinga...bang on target". Ravi Shastri's comments "that went like a tracer bullet" and "that's what the doctor ordered" are as frquent as Kamran Akmal's dropped catches! Will someone tell Sunil Gavaskar that his oft repeated comment "VVS Laxman stands for very very special" has nothing special in it? In the last season of IPL, said Gavaskar about Jaidev Unadkat, the wiry pace bowler from KKR "put some moustache on him and he'll look like Vekatpathy Raju". It seems poor Unadkat lost his confidence after that. For Sunny bhai, Sachin can do no wrong! If you have seen Brett lee bowling to Sachin, the ball hitting the ouside edge of Sachin's bat, and the bat turning in his hands, the ball taking the outside edge of the bat and going for a four and Sachin beaten all ends up, then its the fault of your "nazar". You have to witness it through Gavaskar's "nazariya". "Look at sachin, very intelligent batting, that was deliberate. watch how Sachin loosens his right hand so as to keep the ball down. Very intelligent." Actually its very intelligent on your part Sunnybhai!! Navjyot Singh Siddhu, can single handedly beat Harsha Bhogle, Cyrus Broacha and Shekhar Suman together when it comes to non stop talking (not necessarily sense)! His lines like "the pitch is senile and as dead as a dodo" and Siddhuisms like "as poor as the church's mouse"are as predictable as Agarkar's full tosses in the slog overs! Siddhu's matching turbans and ties have more variety than his comments!! The run out specialist, Sanjay Manjrekar's commentary is as good as his technique of running between the wickets. Sometimes when you get tired of laughing at Munaf Patel's bowling you should listen to Sanjay Manjrekar's commentary. Many years back, the West indian fast bowler Winston Benjamin bowled a bouncer at him and cut his upper lip. Indian cricket lovers would have loved it if Benjamin had aimed an inch lower. At least the cricket lovers would be spared of his commentary!